I just love this fabric! It is Whimsy by Pillow and Maxfield for Michael Miller Fabrics. I think the blue, green and white reminds me of pretty Mediterranean tiles near the water. 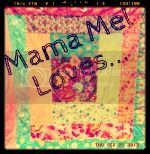 I was originally just going to sew all the giant 9" squares together as a patchwork quilt, but then I bought a jelly roll of white and once I put it in between the "tiles", it just made all the colors pop out! I am so in love with this quilt so far! I only have a couple of rows done, but I am so excited to see the finished product! 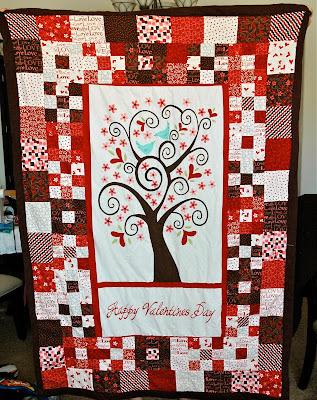 I'm preparing for 3 more quilts that I'm going to make for May, June, and July. One of them, I can't show you because it is going to be a surprise for a certain someone who occasionally reads my blog. These other two are going to be gifts. 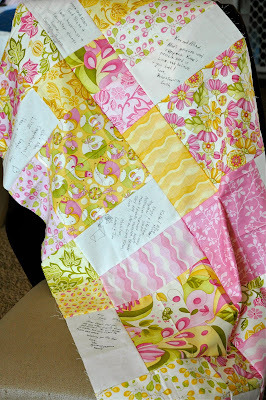 The first set of cut squares is using Moda's "Love U" line of fabric. 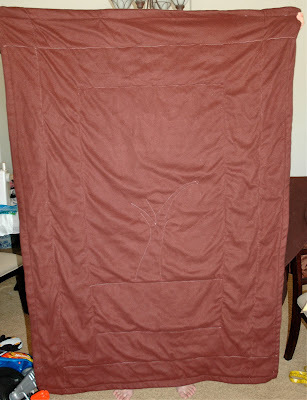 I will also be using the panel that goes with it, and probably just some simple patchwork around the panel. My sister requested one for her friend who is expecting. The second set of cut rectangles is for my sister, who kind of got to choose her fabric. I pretty much saw this fabric (Moda's Blush by Basic Grey), and thought of her. She loves brown with blues and pink. I'm planning on making a garden brick wall style quilt with this fabric. ...and I finally finished this one for my hubby. Boy am I sick of looking at this thing! He loves it, of course, even though it is a bit "girly". It keeps him warm when he sleeps, and that's what matters. He requested a fleece backing because he doesn't like the feel of plain cotton fabric on his skin. Picky, picky... :) So, I didn't use batting with this one. It would have been way too thick for him... and my sewing machine! It was pretty easy to finish. I just used a simple chocolate color fleece. Can you believe I'm working on 5 quilts at the same time?! Am I crazy or what? I'm also working on something else for some very special kids. Will post about it soon! Have a great week, everyone! You are amazing! Glad you are back in business and feeling well.